Although the key surf safety message for all beachgoers remains ‘swim between the red and yellow flags’, the new campaign provides people with the simplest way to escape a rip. 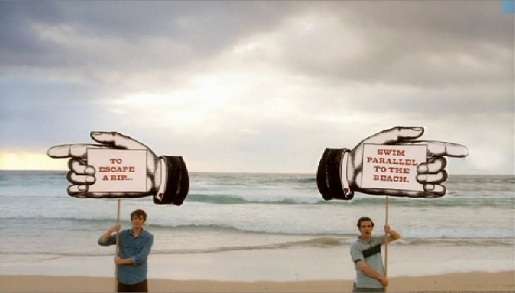 The campaign’s tagline, “To escape a rip, swim parallel to the beach”, is specifically targeted at males aged between 25 and 34, who are over-represented in beach drowning data and who often swim at unpatrolled beaches. The aim of the campaign is to teach people how to survive a rip in case there isn’t anyone available to rescue them. The Rip Currents campaign was developed at Banjo Sydney by creative directors Georgia Arnott and Jon Burden, art director Andres Fabian. Filming was shot by director Jack Wung via Window Productions with director of photography Matt Stewart and producer Nick Simkins. Post production was done at MRPPP by editor Dan Mitchell and compositor Jim Bullard.